When Marquis Wines Cellars (1034 Davie Street) heard about the shooting that occurred at Pulse Nightclub in Orlando, Florida, it was instinctual for them to do something to support. The Marquis Wine Cellars’ display is meant to be moving, simple and to the point. It reads “We are with you Pulse” and then goes on to list the 49 names of those shot and killed on Sunday, June 12, 2016 during this horrific anti-gay hate crime. 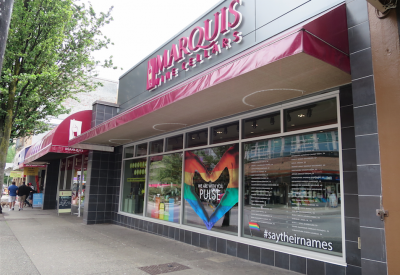 Marquis Wine Cellars has called the West End home for 30 great years and have proudly supported the LGBTQ2+ community through numerous events each year including the Vancouver Pride celebrations. In addition to the window display, Marquis Wine Cellars has again partnered with the Vancouver Pride Society for their Summer Wine Series. Last year, this program raised over $600 and this year Marquis Wine Cellars aims to top this. The promotion will run from July 1 to August 8 and participating wines will be listed on their website.